A Tonk's Tail... err, Tale...: Move Over, Red Dot! Allie: It looks more violet, if you ask me, Maxie. But it just turned green and...and...made babies or something! Holy cat, we'll never catch them all! Call the exterminator, Allie! We're infested!! Our dad loves scientific gadgets, and when he saw a 405 nanometer blue-violet laser, he just had to buy it. And then he found a 532 nm green laser! He only bought one of each, honest. What you're seeing in that last photo is an optical effect. It's a single laser shining through a diffraction grating. 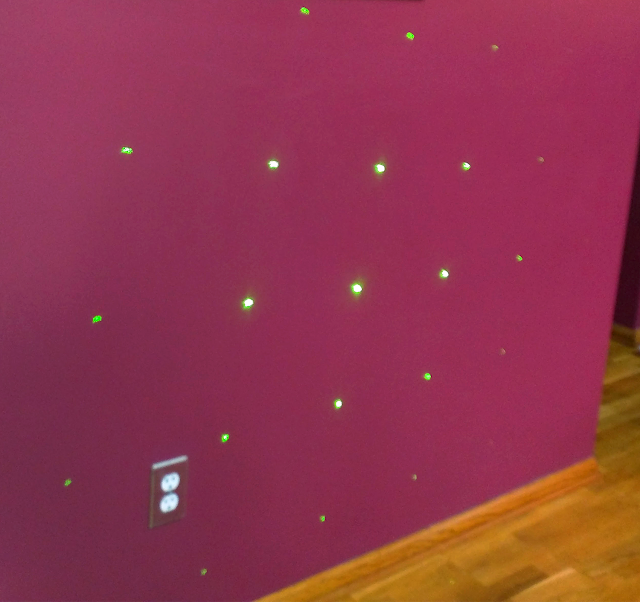 It splits the laser into a multiple dot pattern. Boy, the kitties will NEVER catch all those! I am kind of glad I live with a musician instead of a physicist! I don't know if I could take that many red-violet-green dots! OMC, dat are a ton of dots! I'd go nuts. That looks so beautiful on the wall! Living with a Fizzy Cyst must be very difficult!! and mes thought my Mommy was geeky!!! Mommy sended the post to my human brother, Mes can see Ninja now after mt human brother makes a grate for his laser!!! Wow! That's a lot of dots! 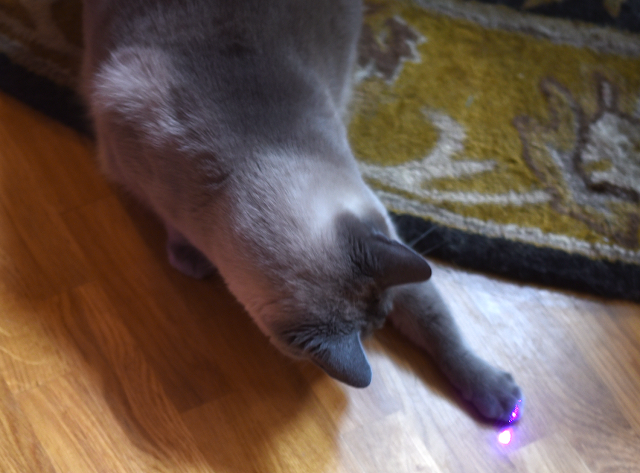 Did you find the laser in your BlogPAws swag bag? We expected Pierre to love it but it is Bentley that chases it! It's a dot family reunion! Oh boy, my cat bro Bert would be going nuts! Holy carp! It's a red dot attack!! ohhhhh that is something else!!! Happy Hug Your Cat Day!!!! Sending you all hugs from all of us!!!!! TBT says he unnerstands diffraction gratings, but WE dont. But as long as its fun, we sure don't care. Wow! That's going to send you crazy!